We organised Arata's birthday party privately for the first time. He had birthday parties organised by kindergarten or nursery before but this was the first time for him to invite friends to his own birthday party. 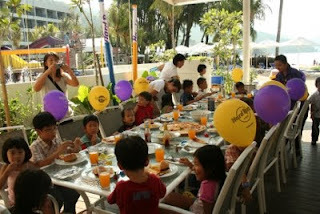 Apparently, in Japan or Malaysia, it's not that common to invite lots of kids to young children's birthday parties. But Arata is also British. Let's do the British way sometimes! 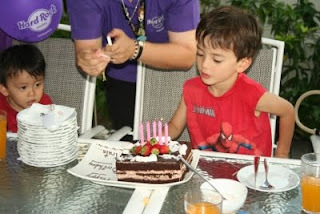 As Arata's birthday is always during school holiday, we planned his party 2 weeks earlier. 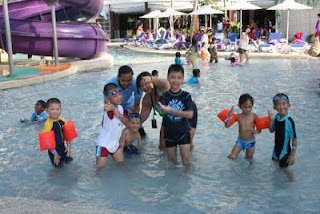 We invited his friends to newly opened Hard Rock Hotel, Pizzaria and swimming pool. To invite all his friends in his kindergarten, it would be over our budget. We decided to invite only boys from the English class, but Arata insisted to include 2 girls. Teacher Nora, I asked her to give out party invitations, told me Arata chose quiet and nice girls! Is it his type?? We also invited Arata's best friends, Yuna, Ruka, Taira and Miina. 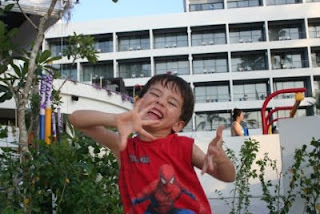 They had early tea, played in the excitingly designed swimming pool and had cake cut. Arata and his friends definitely enjoyed the party. Nearly all his friends from the class are Malaysian and we don't mix up with them at all after school so that I was busy linking children I can more or less recognise to their mothers. It's 3 hours package from 3PM and it was extremely hot for me at the pool side. On top of that, the hotel staff didn't do as much as I expected and I had to manage lots of things by myself. I was exhausted when it was over. I didn't have enough time to have good chats with mothers. It cost about 10 GBP per child, which is the average party cost in the UK if we want to organise the similar party at soft play area. I thought it was not bad first but actually it is quite expensive for Malaysian standards. I will probably only organise a much low key party at home but invite all his classmates next time.